Back in olden times, people used what were called “postage stamps” to send “letters” to “friends” and relatives. Back in olden times people also believed that the US space programme would expand exponentially, returning humans to the moon. These stamps from 1989 survive as an artefact of that vision. Moon rovers, far-out space travel... these were the promises of the US Postal Service in a special series of stamps released in late 1989. I own the postcard versions of these stamps and have scanned them here for your perusing pleasure. 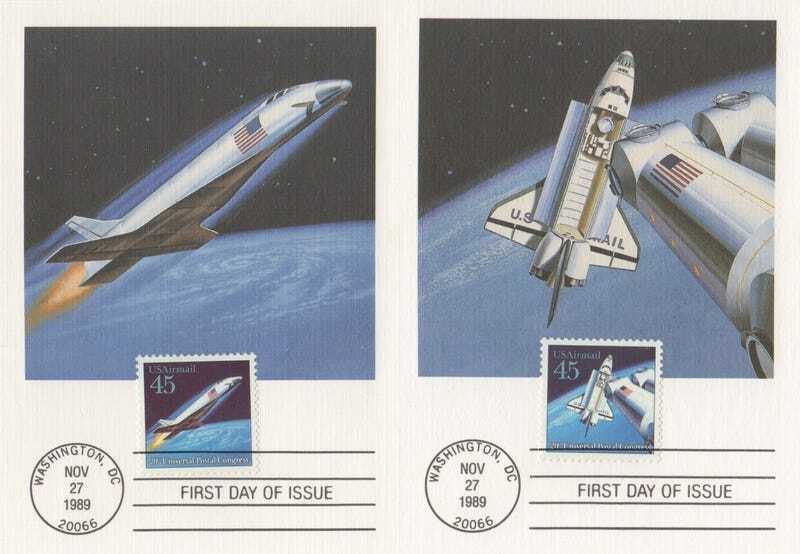 A glimpse at several potential mail delivery methods of the future is the theme of these four stamps issued by the U.S. in commemoration of the convening of the 20th Universal Postal Congress in Washington, D.C. from November 13 through December 14, 1989. The US space shuttle programme was retired in 2011 and the shuttles now sit in museums. The US government has no replacement for the space shuttle program and instead we have vapourware promises from companies like MarsOne who insist that humans will soon be putting footrprints on Mars.